Part of the namesake Sai Khao Waterfall National Park, this rather impressive waterfall merits a trip out to visit if you have some time on your hands. The 40m waterfall comes off a sheer drop and cascades down through a gorge through for about 600m before it reaches the park office. 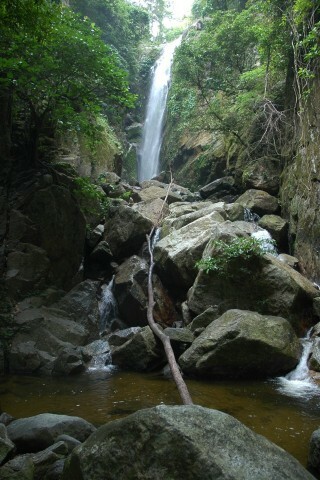 The waterfall has numerous swimming holes and is teeming with some very good-sized fish. The walk up to the falls follows the side of the very narrow gorge with the dense forest occasionally totally blocking out the sky. When you reach the main falls note the remnants of a metal ladder on the right — one used to be able to climb this to above the falls. Keep an eye out for the spiders, the gorge is home to some spectacular and particularly nasty looking ones. Aside from the waterfall there is also a scenic viewpoint. From the park office follow the trail that runs off to the right (when facing away from the falls) and follow it for the 1,200m to the viewpoint. Last updated on 24th December, 2016. The falls are 35km from Pattani town and can be reached either by chartered motorcycle taxi or by bus and then motorcycle taxi. If you're going by bus, take a Yala bound bus and hope off at the 28km marker at the village of Na Pra Du. From here the turnoff on the right leads to the falls, 7km away. The turn off is well signposted and motorcycle taxis in Na Pra Du will happily take you the last 7km. Browse our independent reviews of places to stay in and around Pattani. Read up on where to eat on Pattani. Check out our listings of things to do in and around Pattani. Planning on riding a scooter in Pattani? Please read this. See below for more sights and activities in Pattani that are listed on Travelfish.org.